Jean-Pierre Antonio and I have been friends since elementary school, when we shared the grade five classroom art corner and snuck off with class-mates to explore the nearby creek during lunch hours. 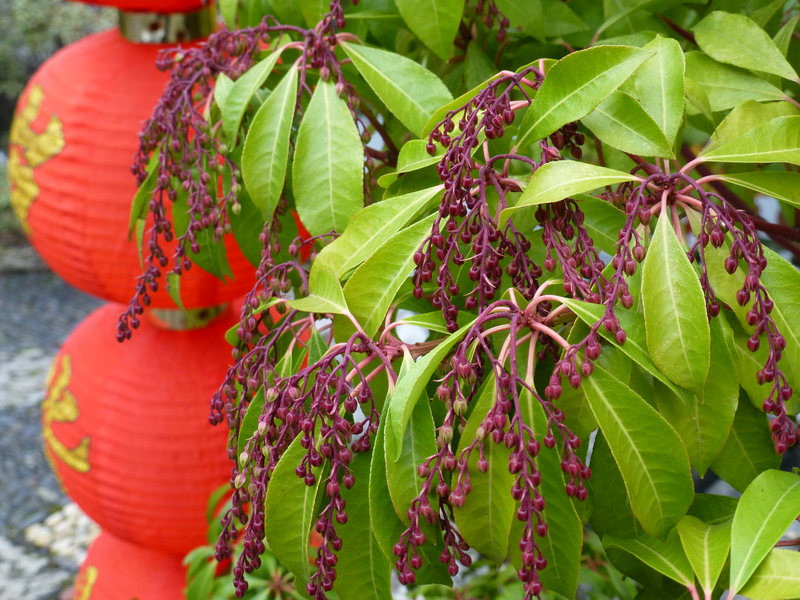 Jean-Pierre has lived in Japan for the past 25 years. 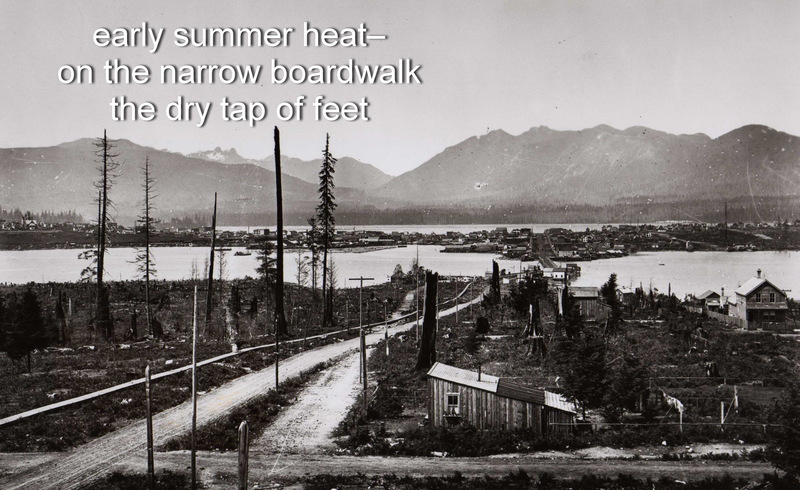 I’ve enjoyed hearing about his experiences, have visited him there, and we’ve done some collaboration featuring Jean-Pierre’s photographs (taken in Japan) and my haiku written in response to the photographs (here’s a post on our 2010 exhibit at Sawa restaurant-gallery in Vancouver). Recently, I found myself responding to one of Jean-Pierre’s emails with a poem that seems to be part haiku, part tanka. 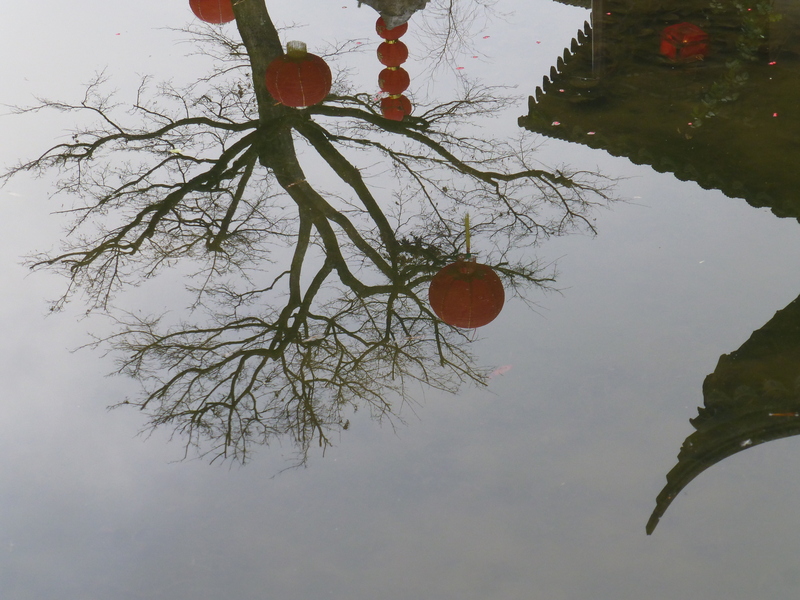 Together, the two pieces form a kind of haibun (a writing form combining prose & haiku). Perhaps this will be a new trend in our collaboration. The clouds rolled down from the mountain today, bringing drizzle just this side of snow, and drawing the heat out of my body as I rushed home after work. 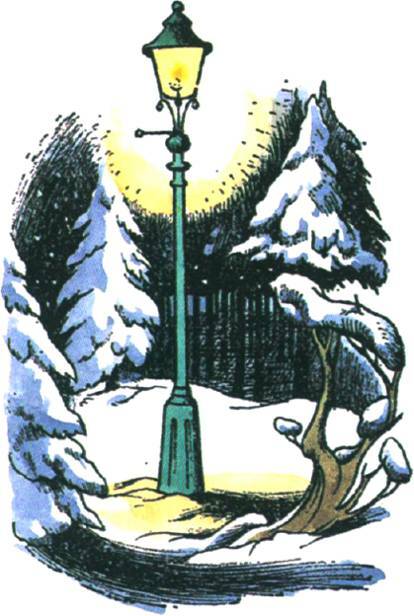 I thought of the scene in the movie version of The Lion, The Witch and The Wardrobe ──the one in which Lucy meets the fawn, Mr. Tumnus, by the lamp post. It’s snowing, and she is wearing just a light skirt, blouse and sweater, and she is very cold. He invites her for tea, and they go to his cave-home. Inside, there’s a fireplace with a warm fire already lit, and he brings out the pot of steaming tea, along with sugar, milk and toast. That’s what I want today ─a warm fire to put the heat back into my bones, the orange tinted light to drive away the grey outside, and a soothing pot of hot tea. 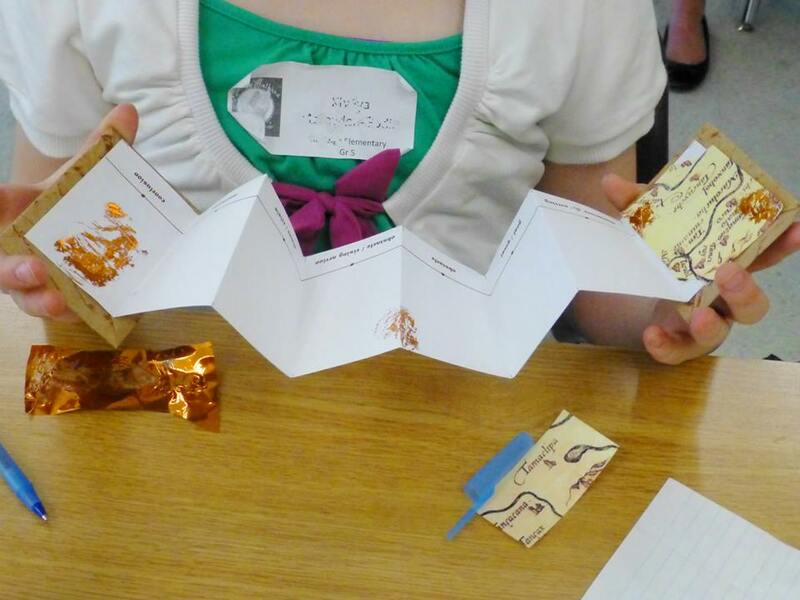 Last spring I did some accordion book-making with kids as part of a writing workshop I taught at the Kamloops Young Authors Conference. We talked about how each story is a “hero’s journey” (with a quest and obstacles to overcome along the journey), then we created accordion book plot diagrams (with participants plotting out their own hero’s journeys). 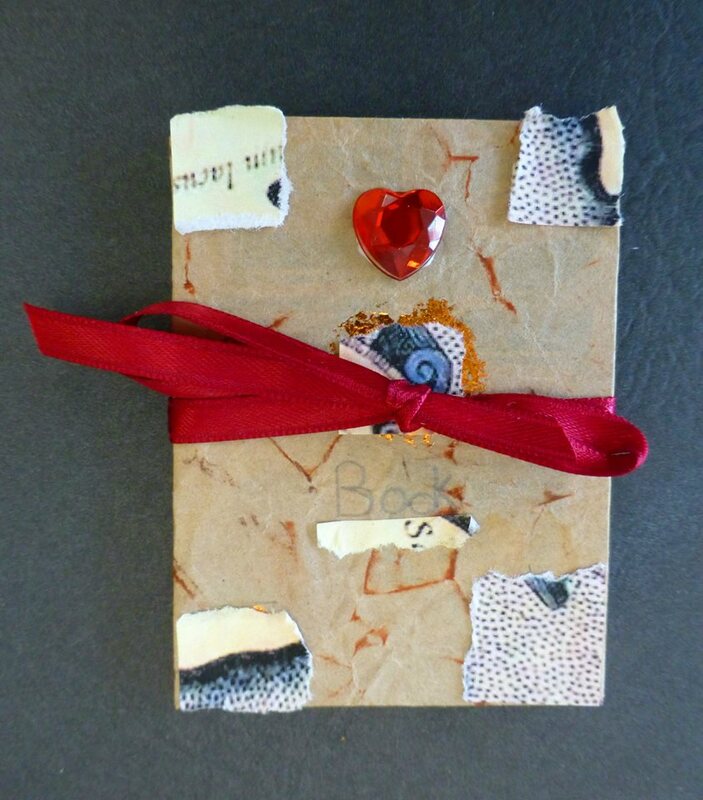 The books are also meant to look old and mysterious ─part treasure map and part talisman. The kids’ books turned out great! 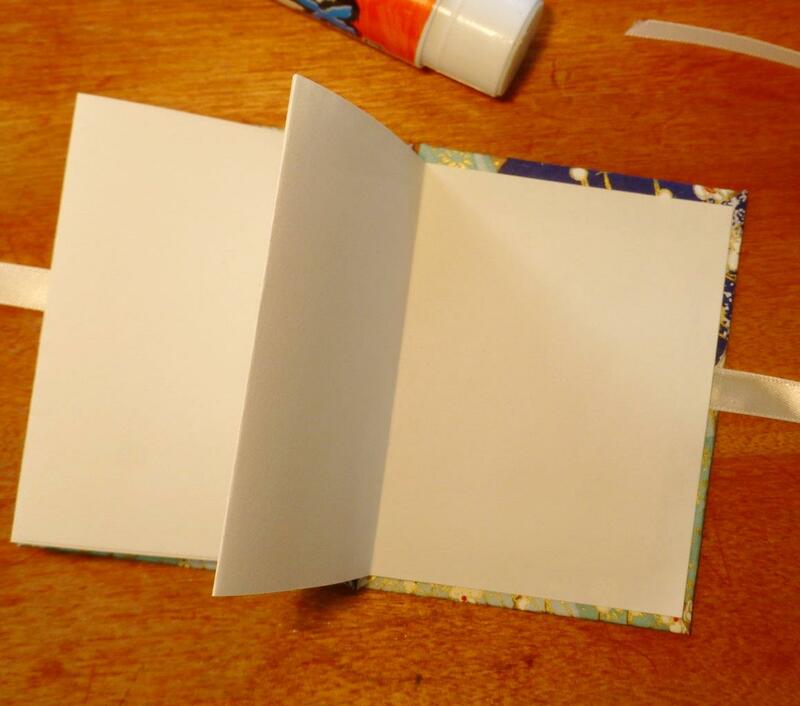 Before the workshop, I set out my supplies to photograph the directions for making a simple accordion book. Of course, the first picture was photo-bombed by my cat (aptly named Curious, she always has to check out everything). – two rectangle pieces of cardboard for book covers (cardboard from cereal boxes works well). (For the “Hero’s Journey” book project, I cut the cardboard 2 1/2 inches x 3 1/2 inches). 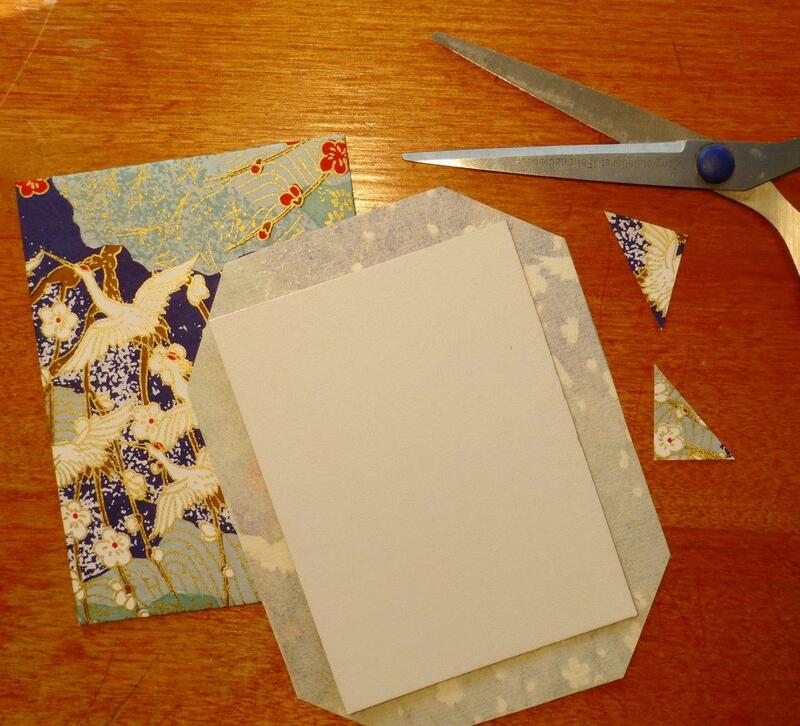 – two rectangle pieces of decorative paper for book covers (the pieces should be larger than the cardboard by about 1/4 inch or so all around). (For the “Hero’s Journey” book project, I cut the cover paper to 3 1/2 x 4 1/2 inches and used kraft packing paper, which I “aged” by crumpling up the paper, then smoothing it out and adding brown ink & tea bag staining). – a strip of paper that will be accordion folded to make the book “pages.” When folded, the pages should be slightly smaller than the book covers (for the “Hero’s Journey project, I cut the paper strip 3 x 16 inches, which fit nicely inside the book covers when accordion folded into 2 x 3 sections –also, three of these strips could be cut from a 11 x 17 sheet of paper). – ribbon or raffia string (my first thought was to use the natural coloured raffia for an antique look, but my cat tried to eat it, so I switched to fabric ribbon). The ribbon should be long enough to wrap around the finished book and tie (I used a 16 inch piece for the “Hero’s Journey” book). 1. Once your two pieces of cardboard and two cover papers are cut, place your first piece of cardboard on top of the back of a piece of cover paper (ie on top the side you don’t want showing). Centre it, so that there is an equal overlap of paper around the cardboard. 2. Cut the corners off the cover paper at the corners of the cardboard. 3. 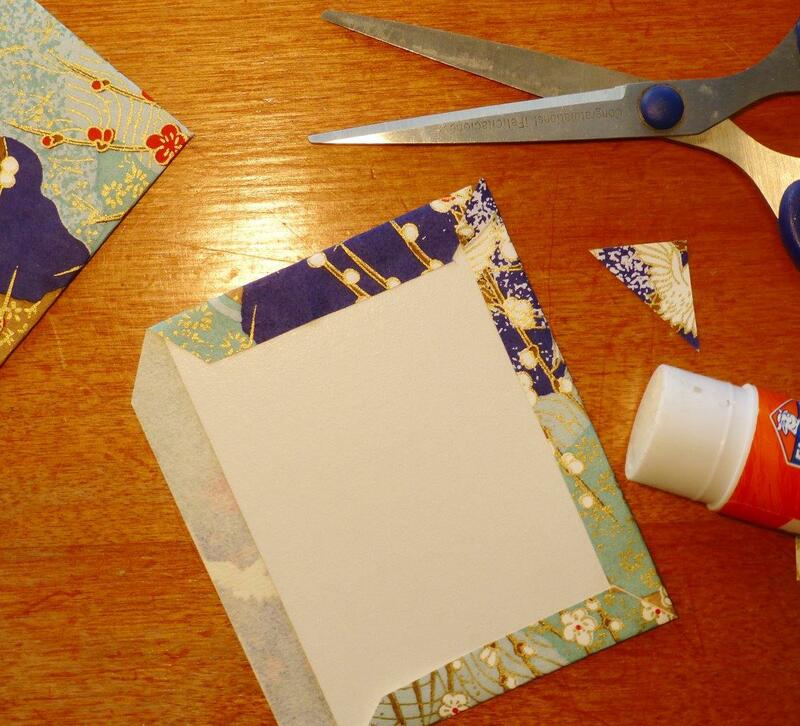 Fold the edges of the cover paper, so that they wrap tightly over the sides of the cardboard. Glue. (Do this with both covers). 4. 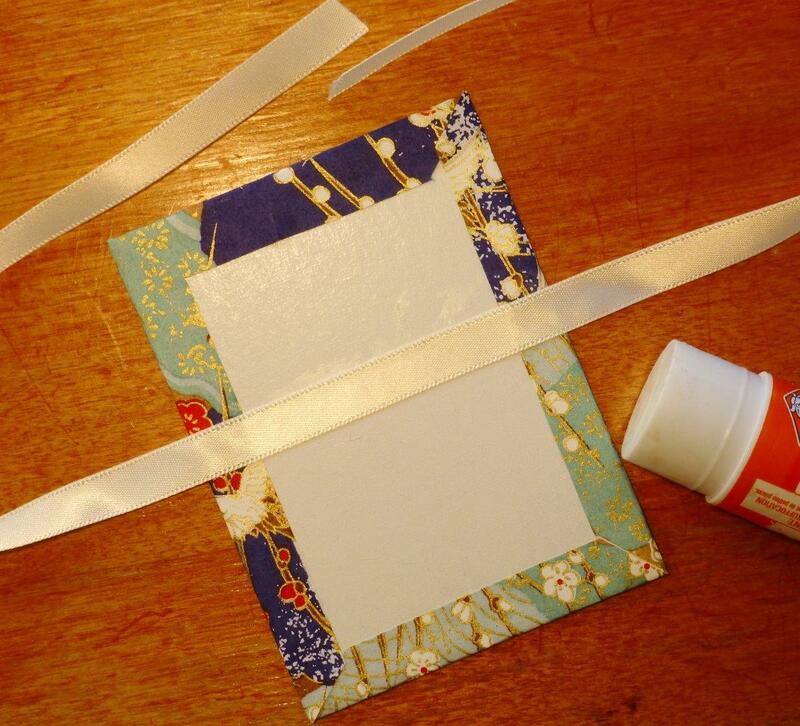 Glue ribbon to centre of inside back cover (with equal amount of ribbon on either side). 5. Fold long strip of paper in accordion fashion, so that it divides into equal rectangles sized slightly smaller than the covers. Glue end rectangle “page” of accordion folded strip onto centre of back cover (over the ribbon). Glue the first rectangle page over the inside of the remaining cover, so that when the accordion folds are folded together, the covers come together. 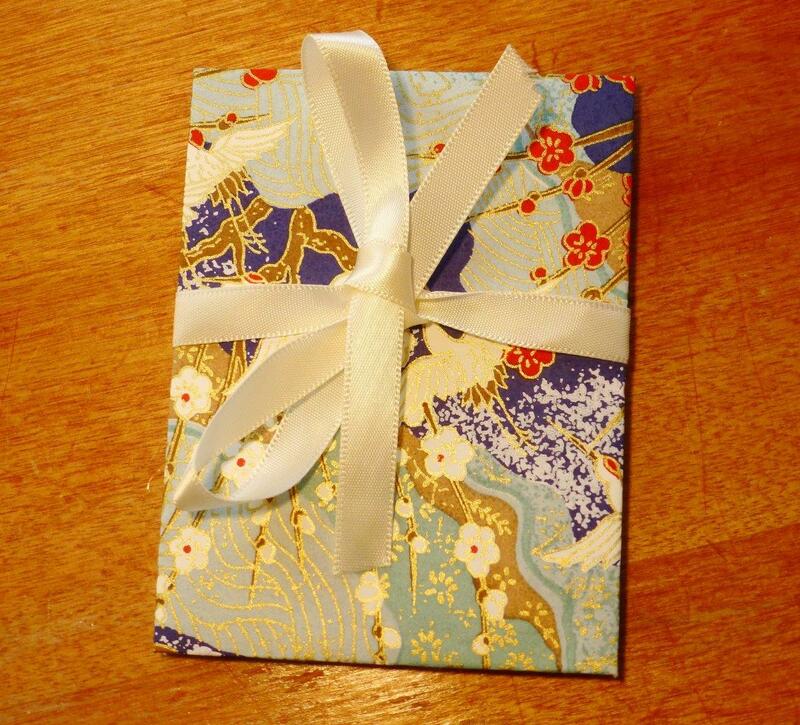 6. wrap the ribbon around the front of the book and tie a bow. Two hundred years ago, in July 1814, American troops attacked Fort Erie (in what was then British Upper Canada). The British surrendered with only a few shots fired (the fort’s commander was later court-martialled for giving up too easily). The British withdrew from the fort, but made plans to get the fort back. In early August, they set up camp outside the fort, just out of reach of the fort’s guns. After dark, on August 15, 1814, about 2,400 British soldiers, Canadian militia and First Nations allies attacked. Under the cover of darkness and the heavy gun smoke that hung over the surrounding field, the British stormed the walls of the fort and captured the northeast bastion. Within the fort, the Americans turned a cannon around and fired at the British on top the bastion. The British turned one of the captured cannons and fired back. As this close-range cannon battle raged, a spark found its way to the powder magazine under the bastion. The explosion killed 400 men (mostly British and Canadians) and turned the tide of the battle in favour of the Americans. The British retreated from the fort (with almost the entire column that had attacked the bastion, wiped out), but continued their siege for days. By the time the siege ended on September 17, 3,500 men were killed, wounded, or missing. It was the most devastating and prolonged battle of the war. 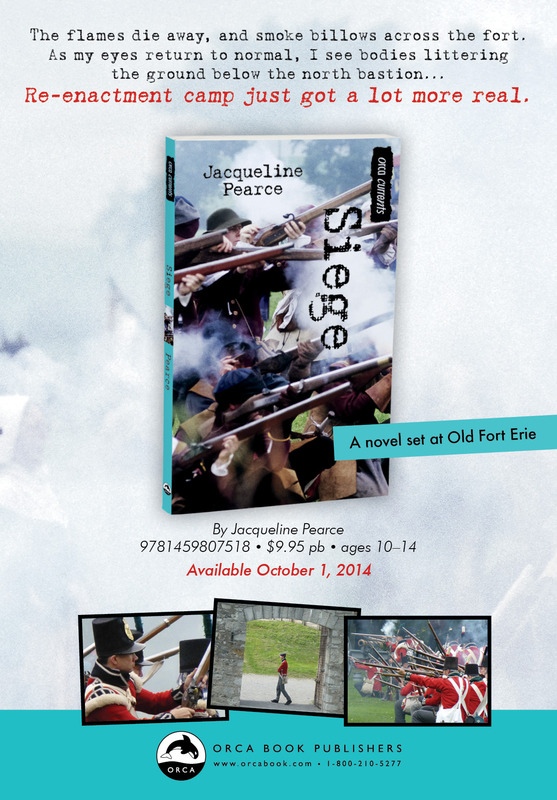 Today, Old Fort Erie is a museum, which I visited last fall to research the setting of my new novel Siege (for readers approx. ages 10-14), which will be out October 1. 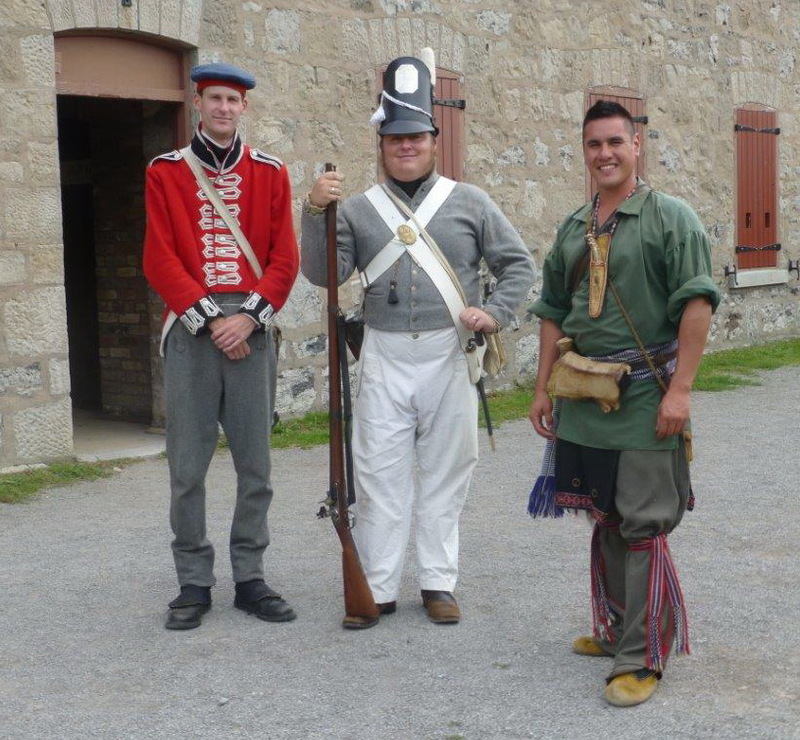 This coming weekend (August 9-10, 2014) hundreds of re-enactors from both Canada and the U.S. will be gathering at the fort to commemorate the 200-year anniversary of the siege. 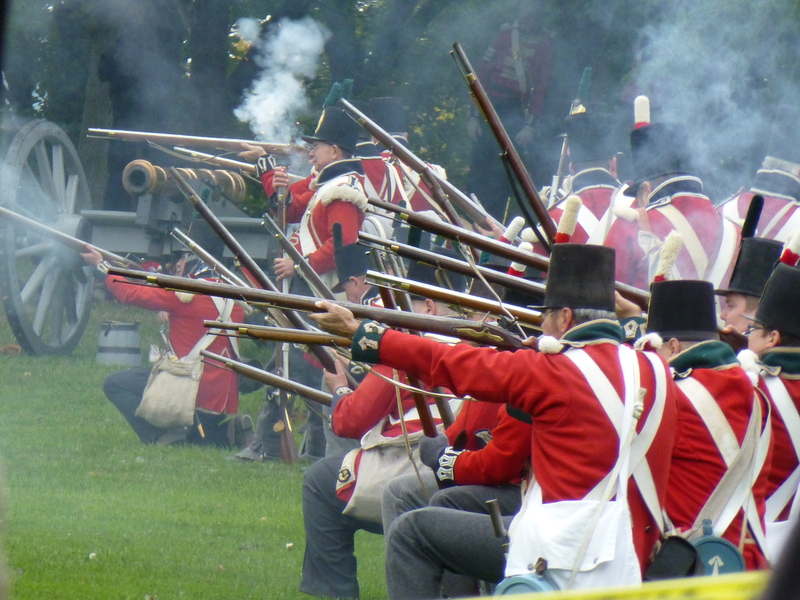 It promises to be the largest War of 1812 re-enactment in Canada. Unfortunately, I won’t be at the re-enactment, but I’ll be imagining the characters of my novel on top the fort’s walls in the middle of the musket and cannon smoke. I’ve been “tagged” by author friend Laura Langston to join in a game of blog hop. The rules of the game: answer four questions about your writing and writing process, and tag three more people. Laura writes picture books, young adult novels and adult novels. To see her post on the blog hop, click here. I’ve just finished the final edits for a new novel called Siege (for ages 10-14), which will be out this fall with Orca Books. It’s about a teenage boy who reluctantly attends a War of 1812 re-enactment summer camp and discovers some modern-day criminal activity around the Niagara River and Old Fort Erie. 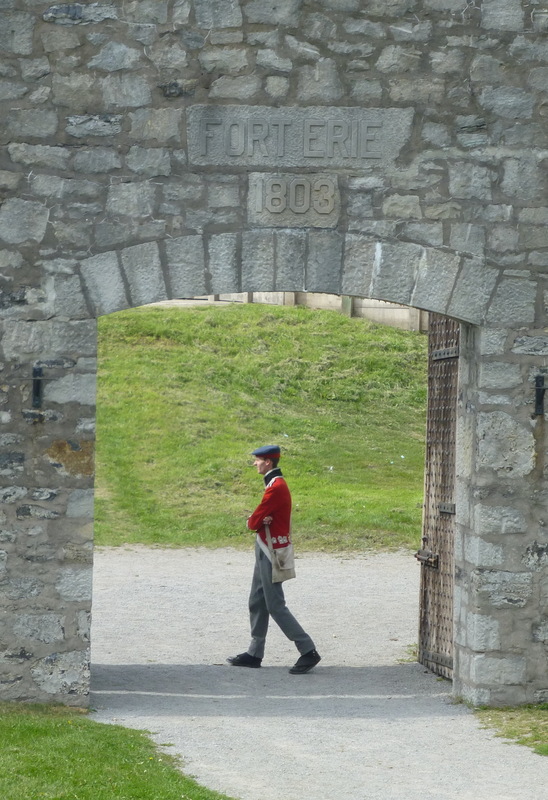 As part of my research for the story, I watched the re-enactment of the Battle of Queenston Heights on its 200-year anniversary and also visited Old Fort Erie. I have a picture book story about the War of 1812 in the works as well. I’m also working on two short non-fiction stories about dogs which will appear in Chicken Soup for the Soul: The Dog Did What?, scheduled for release in August. 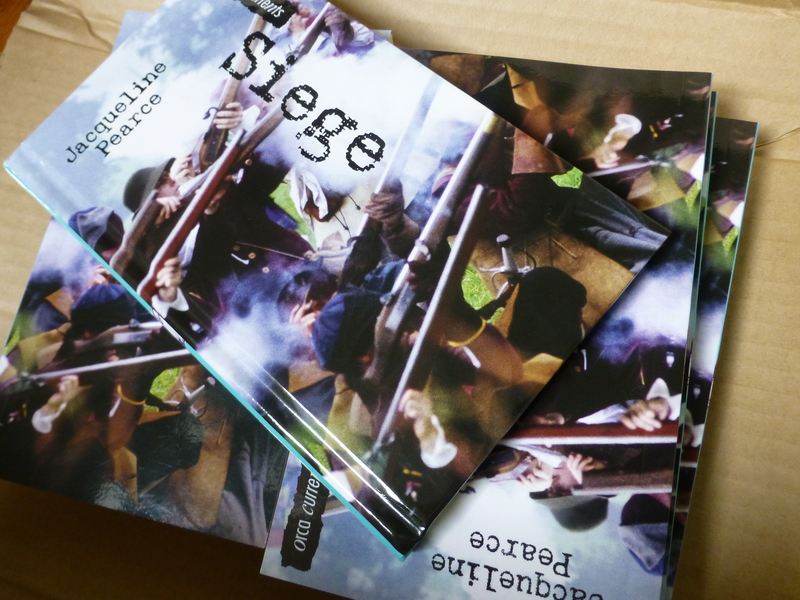 My newest book, Siege, mixes history in with the present day, which is a bit unusual. I don’t think I’ve come across any other stories about people re-enacting historical events. It was fun to write, partly because the main character doesn’t want to be where he is, and I enjoyed writing about his reactions to things like his musket misfiring, the old fort’s ghost stories, and trying to navigate the Niagara River in an old-fashioned row boat. I’ve also written more straight-forward contemporary fiction and historical fiction. 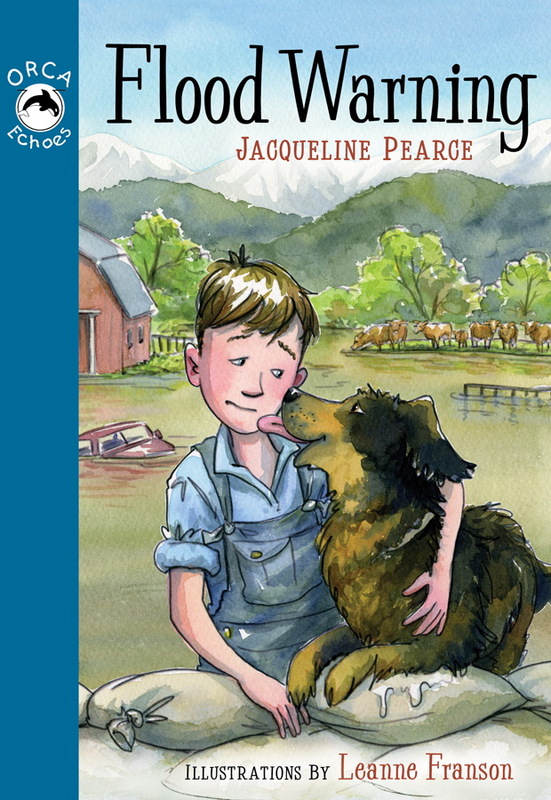 Flood Warning, for example, is a chapter book (for ages 6-8) that takes place during the Fraser River flood of 1948. There aren’t a lot of chapter books that tell historical stories (especially BC and Canadian history), which makes my story (and the others I’d like to write) somewhat unique. 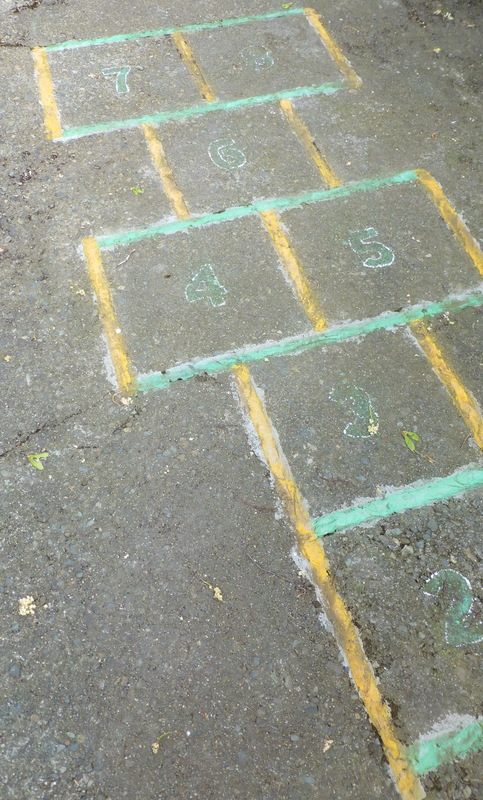 I write for kids because it’s something I’ve wanted to do ever since I was a kid (about the time my dad made the hopscotch in our backyard, which appears at the top of this post). I fell in love with books such as The Narnia Chronicles by C.S. Lewis and the Emily of New Moon series by Lucy Maud Montgomery when I was in grade six and have continued to love books for children (both reading them and writing them). I also sometimes write poetry and nonfiction for adults, but writing for kids is my main compulsion. As for what I write about: I like to explore the world around me and notice things that maybe nobody else is paying attention to. 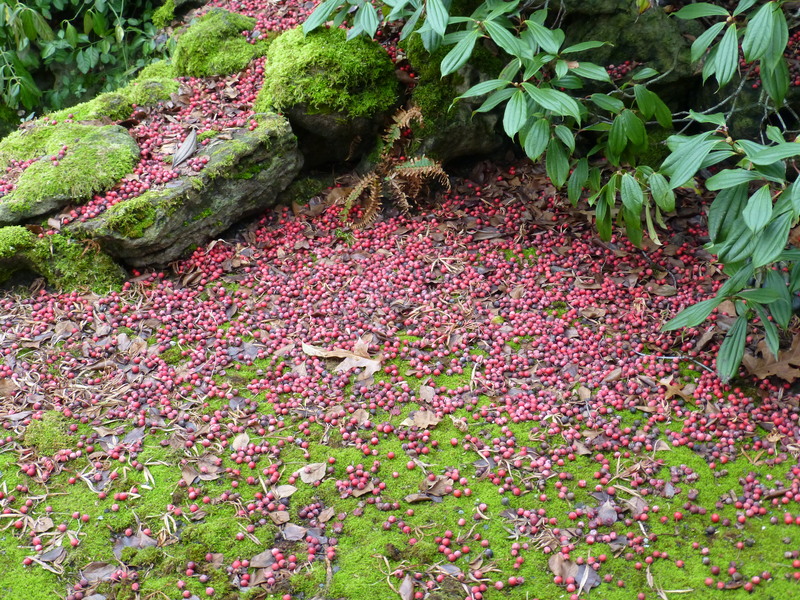 I’m always fascinated by history, nature, and unique bits and pieces that I stumble across. When something surprises or intrigues me, I immediately start imagining it as part of a story (I always keep a notebook handy). 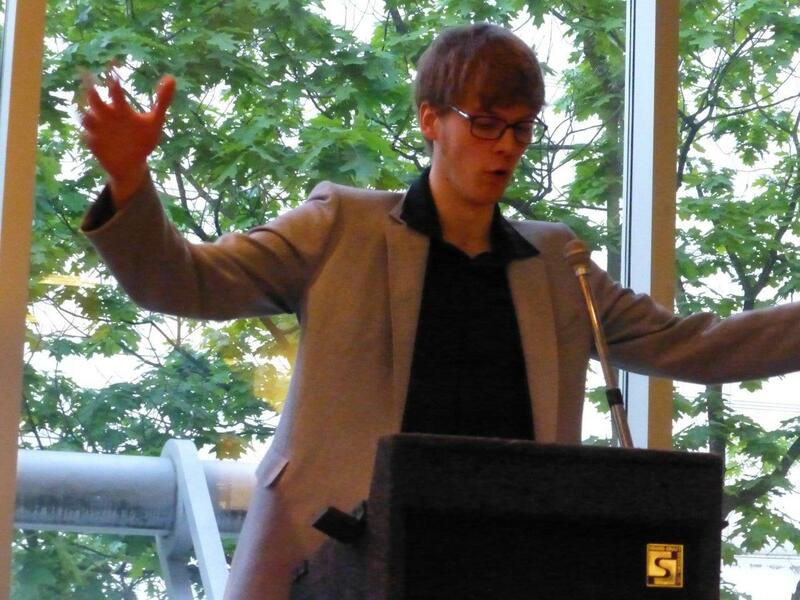 I write about things that interest me and hope someone else will be interested, too. Usually when I’m working on a new story, I do quite a bit of research first (which I always enjoy, especially when it involves visiting interesting new places or trying out some new activity). Sometimes I find it difficult to actually sit down and begin the writing, though, and I might procrastinate by doing more research, or even by doing some different types of writing (like nonfiction articles or blog posts). But, once I dig into a story, it starts to flow, and I get caught up in the world of the story. I do most of my writing from my home office. If I need a break, or get stuck on some aspect of the story, I go for a walk, and usually the problem or the next scene works itself out in my mind as I walk. Rather than doing several drafts of a story, I edit as I go, which means sometimes I can rework the same chapter or scene for days before moving on, and by the time I get to the end of the first draft of the story, it’s fairly polished. 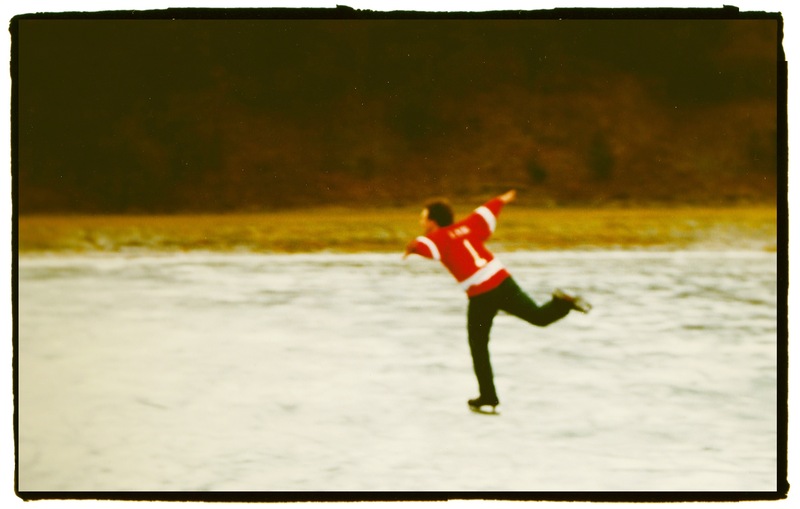 But, of course, there’s always more editing to be done. For the next stop on the blog hop, I’ve tagged Cindy Henrichs and Daniela Elza (I tried to tag a third person, but everyone else got away), and they’ll be blogging on June 16. Cynthia Heinrichs is the author of two books: Mermaids, a picture book about the diving women of South Korea, and Under the Mound, a novel for young adults set in 12th-century Scotland. Cynthia is also a regular contributor to British Columbia Magazine. 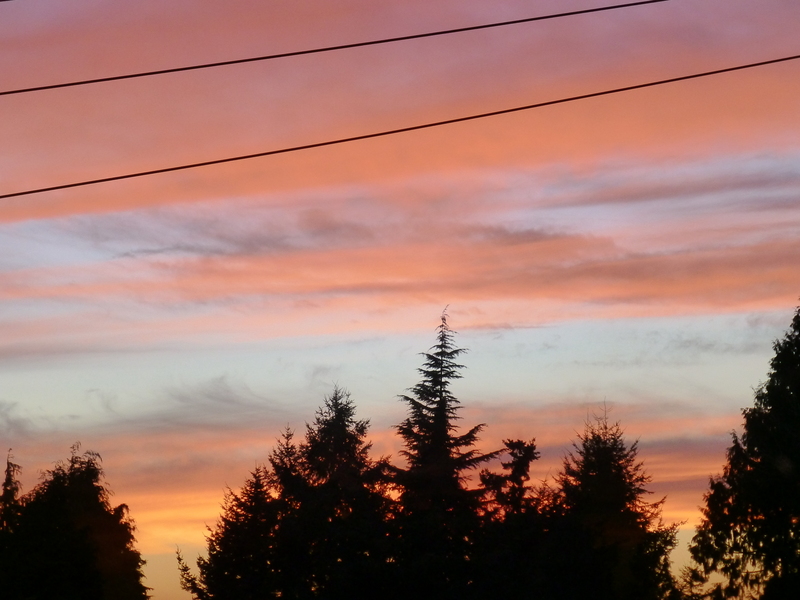 She lives in Vancouver, BC, where she writes and tutors college students in academic writing. To learn more about Cynthia, please visit her website here (and check out her blog on June 16). Daniela Elza had been published nationally and internationally in over 80 publications. Her poetry books are milk tooth bane bone (Leaf Press, 2013), the weight of dew (Mother Tongue Publishing, 2012) and the book of It (2011). Daniela earned her doctorate in Philosophy of Education from Simon Fraser University and was the 2014 Writer-In-Residence at the University of the Fraser Valley. Check out her website here (her blog hop post will be up June 16). Note: If the next blog hop posts aren’t up by June 16, please check again in a few days. 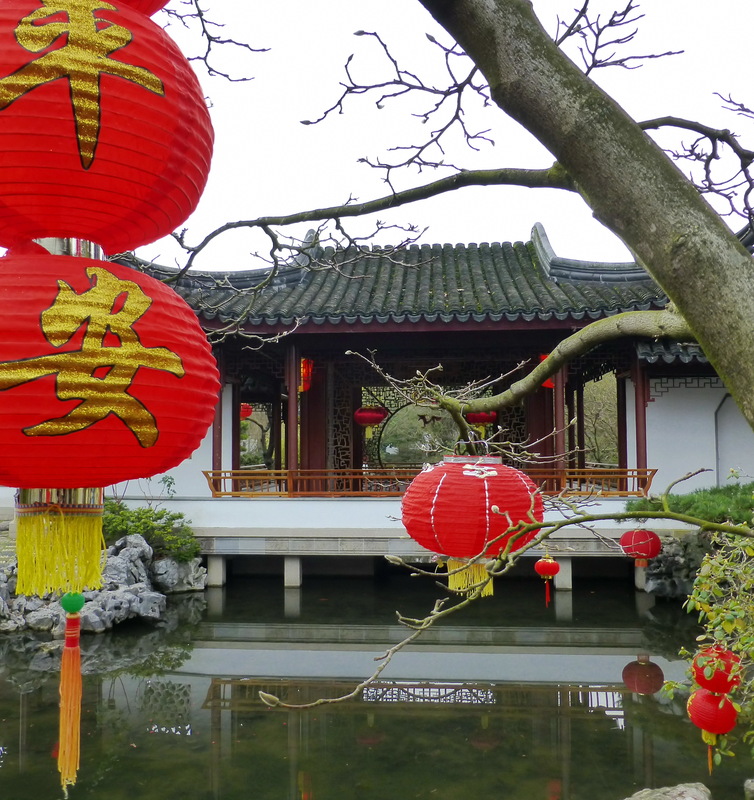 I didn’t expect to see much in Vancouver’s Dr. Sun Yat-Sen Garden in the middle of January, but when I visited last Saturday, I found it blooming with red lanterns and bustling with preparations for Chinese New Year. 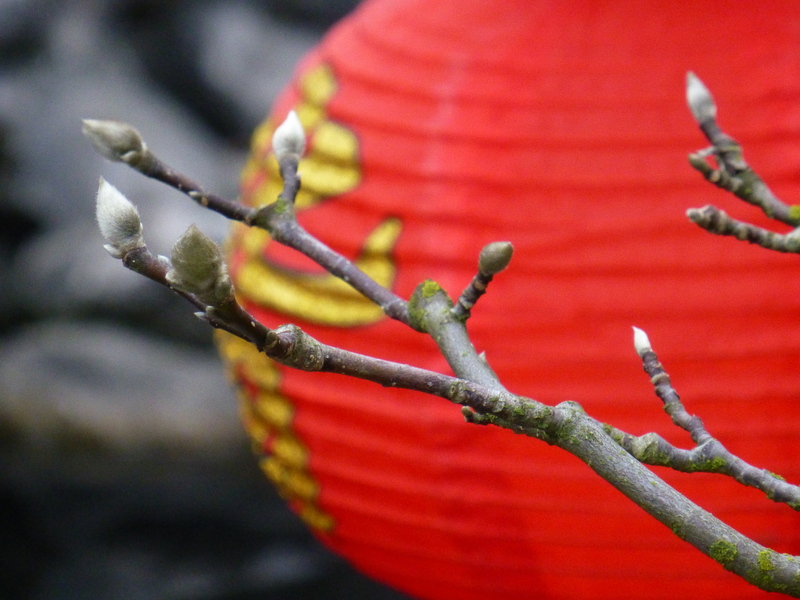 I was also surprised to see winter jasmine in flower and many trees full of early buds. 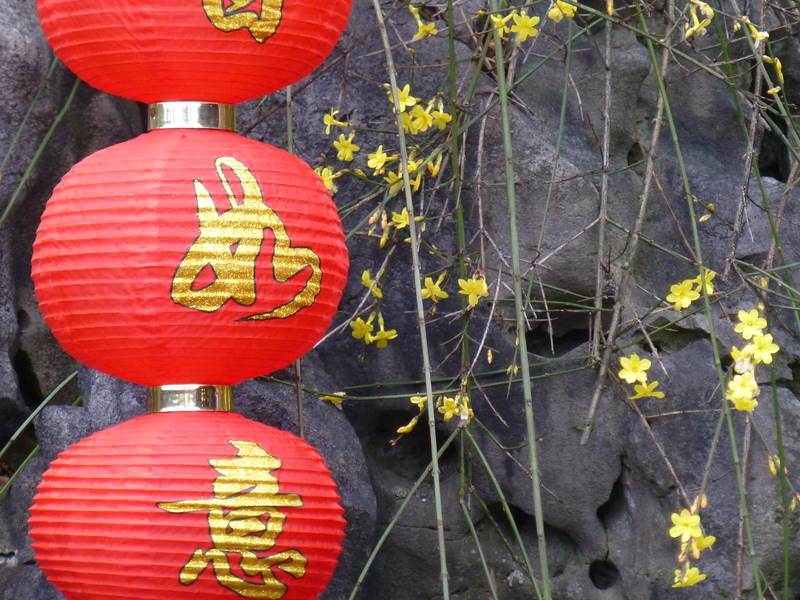 The Chinese lunar New Year (which begins on January 31 this year) is a time for sweeping away the old (dust, clutter, debts, worries) and welcoming in the new (renewing hope for health, happiness, and good fortune). 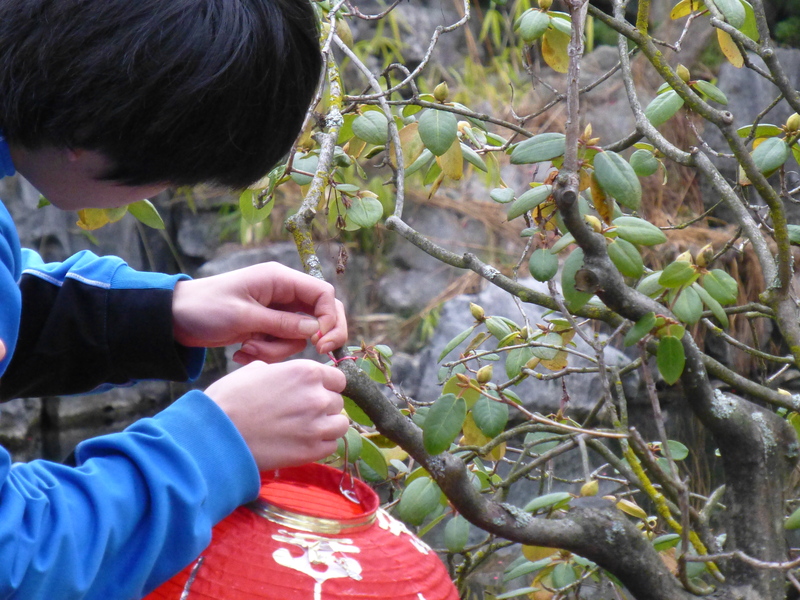 Staff and volunteers at the garden were busy cleaning, tidying, tying up loose-ends, and decorating in preparation for the upcoming Year of the Horse Temple Fair, Feb 2 (2014). 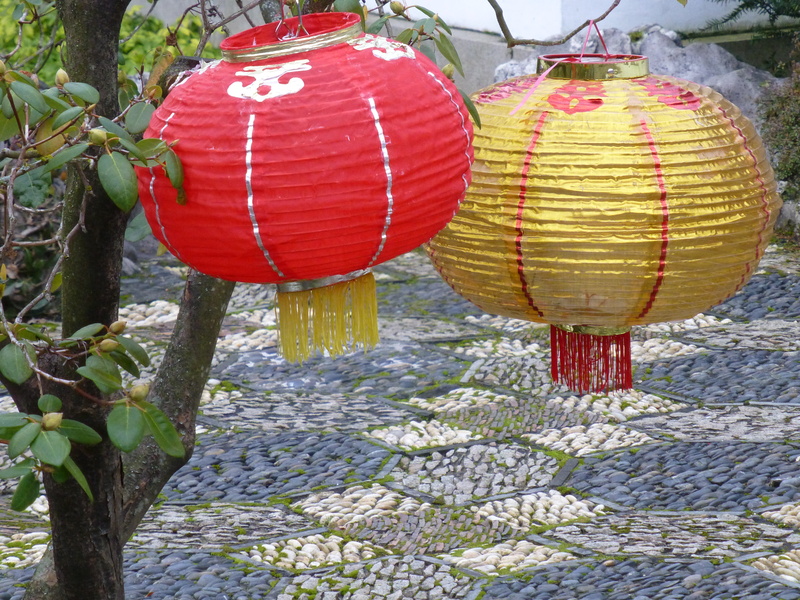 Red lanterns are hung around the garden to bring good luck (red is considered the most auspicious colour because of its association with fire, the sun, energy, light, and life-blood, which demons fear, so it also keeps demons away), and they welcome back the light of spring. 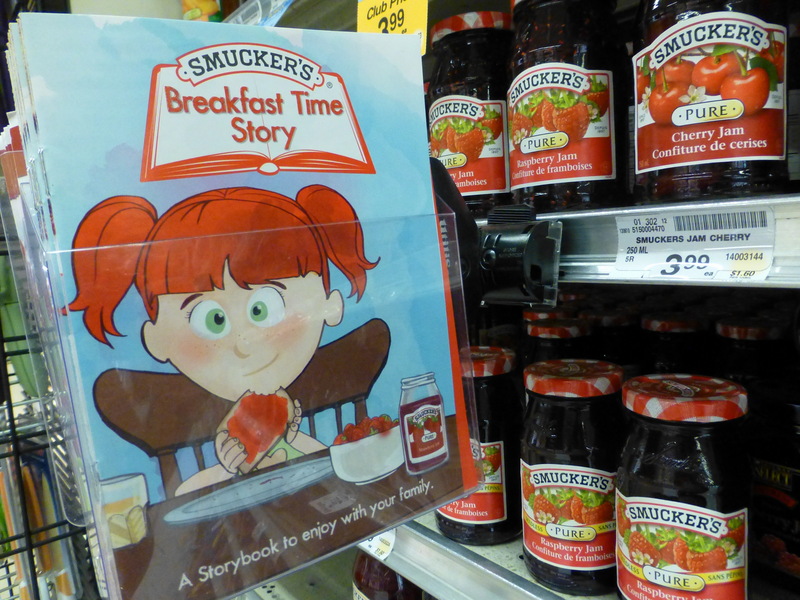 This little “breakfast-time” story I wrote for Smuckers Jam is available right now in the PB & J aisle of grocery stores across Canada (though finding it is a bit hit and miss). You can read or download the whole story here. The story is part of a summer campaign to encourage parents to read with their children (and buy Smuckers jam). 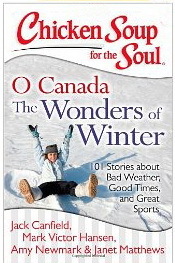 There is also a contest with a story written by children’s author Ted Staunton as the prize. Find out more here (contest ends Aug 6, 2013). It’s a bit confusing, because it sounds like the prize is a personalized version of my story and that Ted Staunton wrote it (my name isn’t mentioned, and I knew it wouldn’t be when I wrote the story for them), but the prize (from what I understand) is a new story written by Ted, and the winning child and his/her family get included in the story. Anyway, I had fun writing the story, and I’m happy to be part of something that encourages parents to read with their children (and I like jam). 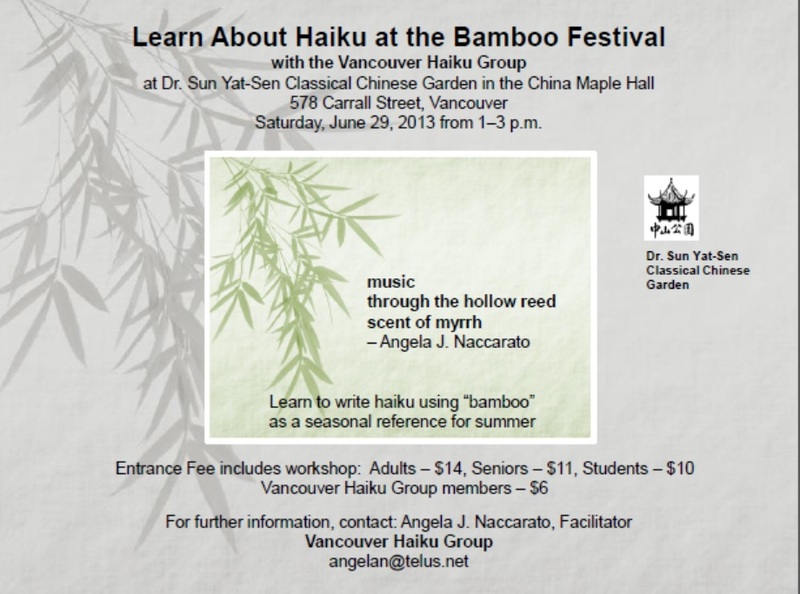 Interested in haiku poetry or how to use bamboo in your garden? 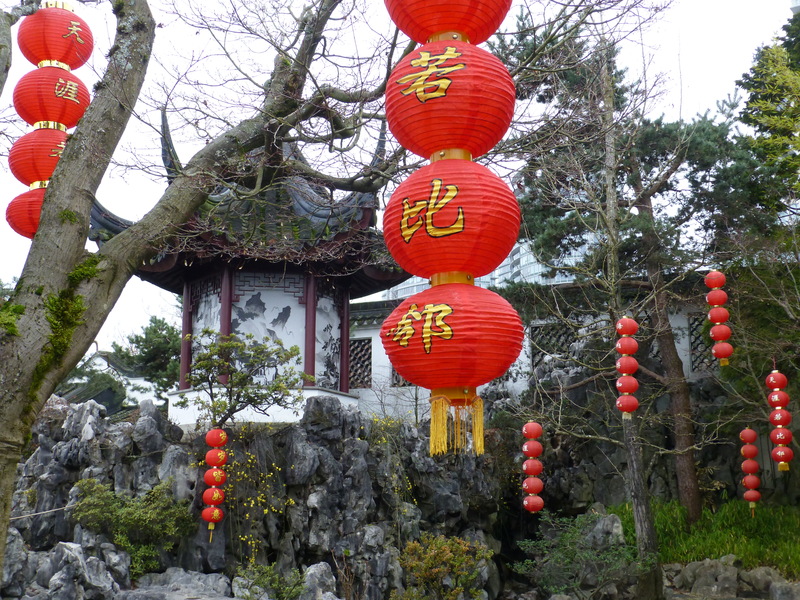 This Saturday I’ll be joining other poets from the Vancouver Haiku Group at Vancouver’s Dr. Sun Yat Sen Classical Chinese Garden for a celebration of bamboo. 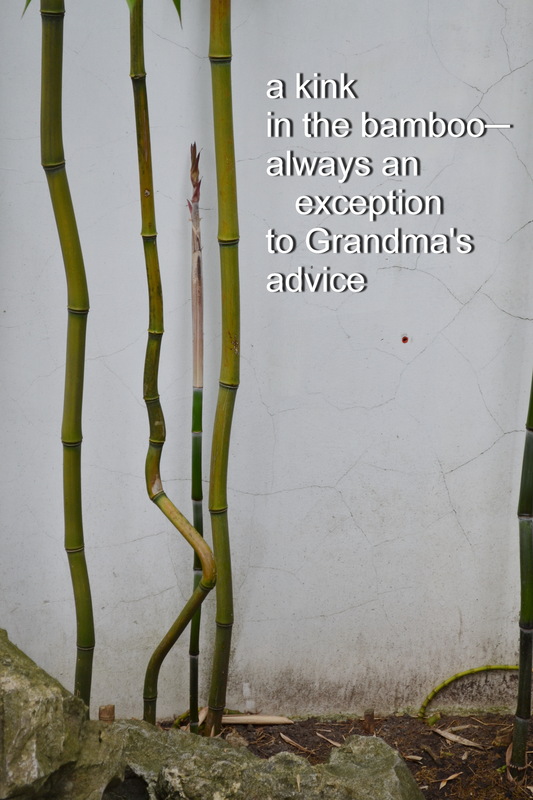 Angela Naccarato, poet and Intuitive Consultant, will lead haiku workshops (open to anyone visiting the garden, with three workshop times between 1-3pm), and I will be sharing some of my photographs of “bamboo in Basho’s footsteps” (from my last visit to Japan). 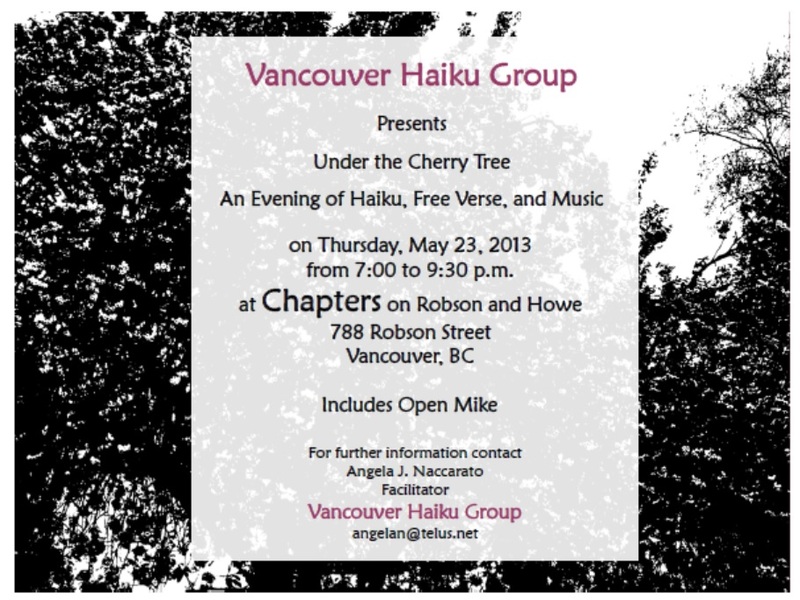 The event was led by Angela J. Naccarato, founder and facilitator of the Vancouver Haiku Group, who read some of her own haiku and free verse. 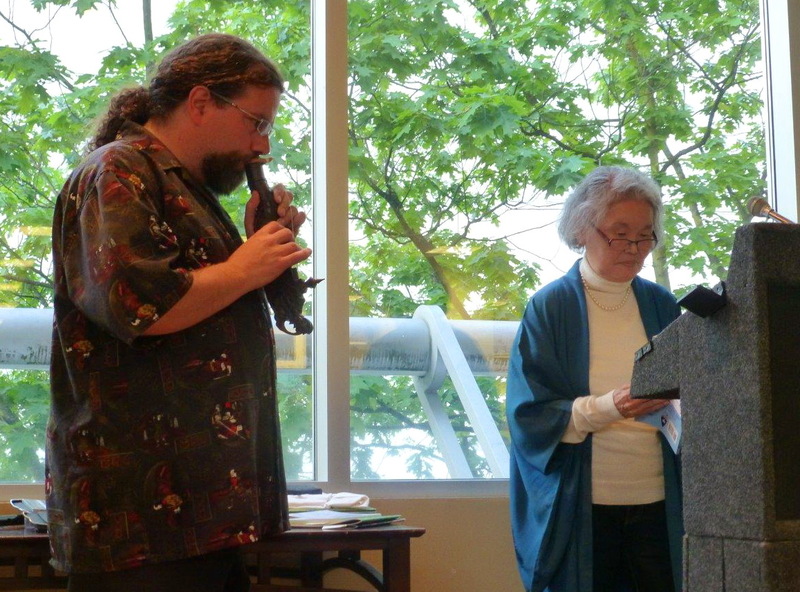 Other poets included Marianne Dupre, Rosemary Carter, Brenda Larsen, Vicki McCullough, Liam Blackstock, Ashok Bhargava, Alegria Imperial, Donna Farley, Kozue Uzawa, James Mullin, and myself, taking the audience on a journey that evoked colours, sounds, and emotions from childhood memories in India to a monsoon in China to swimming with turtles in Barbados to Vancouver’s past to cherry blossoms in Vancouver’s present.